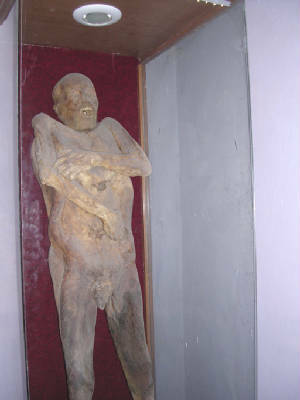 There are about 100 well preserved mummies in a museum in glass cases. One can go from room to room viewing them and taking pictures is allowed. The admission charge is included in the day trip. The same day you can see one o two private artifact collections. Waldemar Julsrud, born in Bremen, Germany, came to Acambaro in 1894. He opened a hardware store. From 1942 to 1950 he had collected over 37,000 pieces of pre-Columbian artifacts of dinosaurs, men, birds, etc. The most of them cam from the nearby hill called Toro. People brought him pieces from a number of old towns. They were all over the area. The Chupícuaro people lived in the area from about 88 BC to about 300 AD. 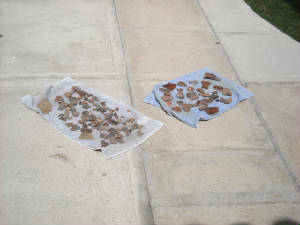 These pieces are pre-Chupícuaro. 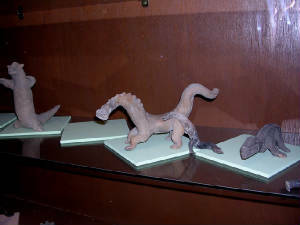 There were hundreds of species of dinosaur figures. In 1954 the Mexican government sent a team of archaeologists to Acambaro. 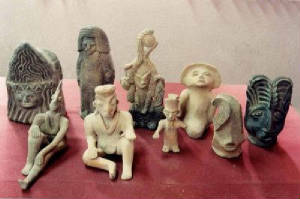 They did a number of "digs" and discovered numerous figurines similar to those that Waldemar had collected. The "official report" said these can not be authentic because dinosaurs and humans didn't live together. In 1955 Anthropologist Charles Hapgood from the University of New Hampshire did an excavation under the floor of a house that had been built some 25 years before the arrival of Waldemar. 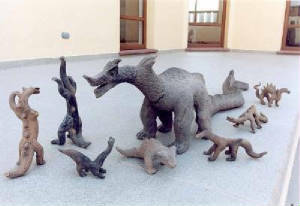 They discovered 43 figures of the same type, including dinosaurs. THREE radiocarbon tests were performed in the Isotop Laboratory in New Jersey. The results determined tha dates from 1110 BC to 4530 BC. 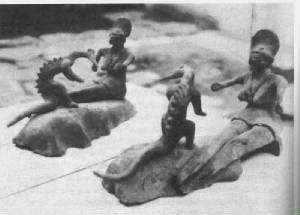 In 1972 18 figurines were sent to the University of Pennsyvalia for testing. The results determined they were from about 2500BC. In 1964 at the age of 89 Waldemar died in Acambaro and his private collection remained in his home, which now houses the museum. In 1990 Neal Steedy did other excavations and the dating resulted in the time era of about 4,000 years ago. In the museum today there are 6 rooms filled with the figurine displays. There are literally thousands for YOU to see. People have come from Sweden, Germany, and Korea to see this mystery. Waldemar Julsrud said, "These are enigmas. These are miracles that we can see, but they are mysteries that human intelligence can not resolve." The question that remains unanswered to this day is how did these people of the Acambara area know what dinosaurs looked like? We didn't know until about a hundred years ago!